Lots of big juicy lemons are so ripe they are starting to fall from our remarkable lemon tree, and we had to do something with them. So today, we put up 3½ quarts of delicious jam. 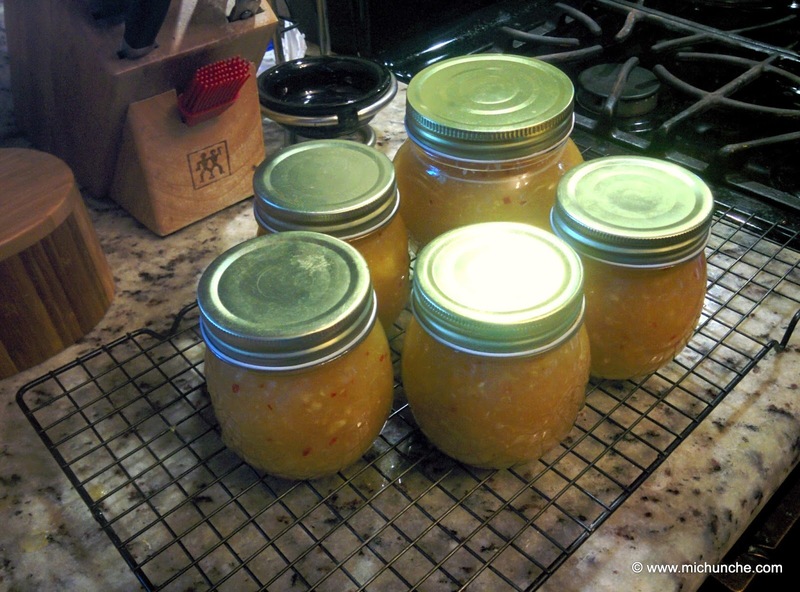 Sterilize the jars and lids. I usually put the lids in a small sauce pan of boiling water to make it easy to use them when the jars are packed with the finished jam. Peel the pineapple, remove the core and dice into chunks. Pulse the pineapple chunks in a blender until well chopped. Add the pineapple, sugar and water to a large non-aluminum stockpot. Remove the zest from the lemons leaving the white pith. Mince the zest and add it to the stockpot. Add the lemons to a separate pot of boiling water. Boil the lemons 3-5 minutes until you can easily pierce the pith with a fork. Remove the lemons from the boiling water and allow them to cool. Slice the Habanero chili peppers and remove the stem and seeds. Mince the peppers and add them to the stock pot. When the lemons are cool enough to handle, slice them in halves and gently scoop out the pulp into a bowl, removing the seeds as you go. Add the pulp to the stockpot. Bring the mixture to a rolling boil, stirring frequently so the sugar doesn’t stick to the bottom. Stir in the pectin and make sure it is totally dissolved and well blended. Boil for another minute. DO NOT OVER COOK! Ladle the hot jam into the sterile jars. Make sure there is no sticky jam on the lip of the jar and top with hot lids to ensure that they seal. Process the sealed jars in a boiling water bath for 10 minutes.